Steed is having bad nightmares which then seem to play out in real life. The reason: A band of telepaths is after the secrets he carries in his mind. Trouble is, the end result of the process is death. It all comes to a head at a Christmas party hosted by Brandon Storey, a noted collector of Dickens manuscripts, amongst other much more sinister things. This one is at the top of my "Top Ten List" primarily because of the tender rapport between Steed and Emma. There are countless little scenes where their closeness really shines through—I live for the tag! Emma playing Oliver Twist is not to be missed ("My, you have filled out! "), and the exchange between her and Steed about the bed in his room is one of the all-time best. This perennial fan favorite is also a favorite of Patrick Macnee's. Steedophiles will enjoy this composite of Steed. 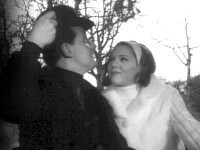 There is a sly reference to Honor Blackman in this episode: as Steed and Emma open his Christmas cards ("And who is 'Boofums'? "), she announces that one of them is from Cathy, and hands it to Steed, who remarks, "Mrs. Gale! Oh, how nice of her to remember me. What can she be doing in Fort Knox?" Liz notes that Brandon Storey, the publisher with the Dickens obsession, was played by Mervyn Johns, who also played Bob Cratchit in the 1951 film version of Dickens' A Christmas Carol with Alistair Sim as Scrooge and a very young-looking Patrick Macnee as the young Jacob Marley! This is the one and only episode of the fourth season for which Harry Pottle was not the Art Director. Robert Jones had the honor on this occasion. Touring Steed's bedroom, Emma admires the four-poster and remarks, "I've always rather fancied myself in one of these." 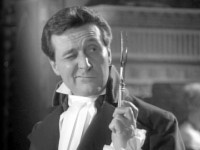 Steed: "So have I—I mean, I have, too." Margaret Warren reminds me of another great line: when Steed and Emma are on their way to the mirror room and Steed is ruminating about people "poking around in one's inmost thoughts," Emma agrees, then they both stop and stare upwards with frowns, and Steed remarks, "And you can put that in your crystal ball!"